In 1844 when God’s people were waiting anxiously for the second coming of Christ there came a great disappointment. He did not come in the way that they expected in power and great glory, but He began the last phase of His heavenly ministry in the Most Holy Place of the heavenly sanctuary. But without this last phase of His heavenly ministry, the work on earth could not be finished and He could not cleanse the sanctuary in heaven or His church on Earth. Daniel 8-14. The Most Holy Place on earth is the hearts and minds of God’s people. Thus saith the High and Lofty one that inhabiteth eternity, whose name is Holy; I dwell in the high and holy place, with him also that is of a contrite and humble spirit, to revive the spirit of the humble and to revive the hearts of the contrite ones. Isaiah 57:15. This disappointment led to a shaking among God’s advent people. The insincere ones who were only emotionally stirred by the preaching of the advent message revealed their true colors and left the faith. To encourage the true and faithful at this time of crisis for the infant church, the Lord gave a special gift – the prophet gift. Ellen Harmon became that mouthpiece for God. Her personal ministry continued for over seventy years. In that time she wrote sixty-three books and thousands of pages of counsel to the church. 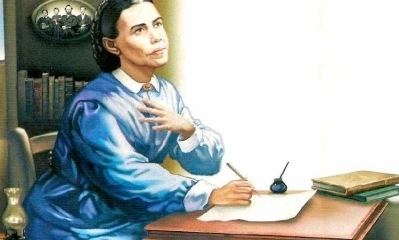 She often arose in the middle of the night to write letters of counsel to leaders of our church. How she could find the time to write so many letters and articles for our magazines is a wonderful achievement in itself. She, with the other pioneers of the Advent Movement, believed that the Lord would come in their lifetime. In that horse-and-buggy age she traveled all over the U.S. preaching to prepare the church for the second coming of Christ. As time went by, she was able to visit other countries by ship and share the gospel message with Europe and Australia. I had the privilege of attending the college that was founded as a result of one of her visions – Avondale College in Australia. Higher than the highest human thought can reach is God’s ideal for His children. MYP. 40. Which is saying in other words that God’s plan for His church is limitless and eternal. The Bible says that the gates of hell shall not prevail against it. Matt. 16:18. What are the gates of hell? Did the gates of hell prevail against the Saviour? No, He broke the gates of hell and death when He arose from the grave in that triumphant resurrection morning. As the gates of Gaza could not prevent Sampson’s escape from the Philistines so the gates of hell could not keep the Saviour in the grave. The benefits of that powerful resurrection He wants to bestow upon His Remnant church. We as Adventists call this experience – the Latter Rain. This blessing that God is anxious to bestow upon His church is what prepares them for translation. (IT 187). They are sealed by the Holy Spirit for eternity. (5T 214). Like Enoch and Elijah they will receive the full benefits of that matchless life, death and resurrection for the Son of God. That is truly higher than the highest human thought can reach and stretches into eternity with My God and your God. John 20:17. This is God’s ideal for His children. Godliness – Godlikeness – is the goal to be reached. (MYP 40).